The cypress weevil, Eudociminus mannerheimii (Boheman), is a native insect that breeds primarily in scarred, weakened, or fallen bald cypress (Taxodium distichum [L.] L.C. Rich) and pond cypress (Taxodium ascendens Brongn.). In Florida, adult feeding has caused limited wounding and girdling of pond cypress stump sprouts and planted seedlings. Small diameter bald cypress nursery stock has also been damaged by larvae tunneling through the main stem and root collar. Apart from entries in species checklists and catalogs, published information about the cypress weevil is extremely limited (Hopkins 1904, Blatchley and Leng 1916, Baker and Bambara 1999). Although the cypress weevil has not been a frequent pest of major economic importance, its occasional damage should be recognized, and the lack of information regarding its biology, potential hosts, and management, warrants further research. Adult: 10.5 to 17.0 mm long; black, covered with thick, small, brown and tan scales; thorax slightly wider at base than long; sides (and sometimes top) of thorax striped with pale scales; three or four conspicuous pale spots (surrounded with black) arranged down the middle of each elytron (on fourth interval). Beak robust, cylindrical, weakly curved, as long as thorax (Blatchley and Leng 1916). Figure 1. Adult cypress weevil, Eudociminus mannerheimii (Boheman), dorsal view. Photograph by Lyle Buss, University of Florida. Figure 2. Adult cypress weevil, Eudociminus mannerheimii (Boheman), lateral view. Photograph by Lyle Buss, University of Florida. Mature larvae: about 20 to 25 mm long; whitish, legless, cylindrical, somewhat C-shaped; head capsule orange to reddish brown. Figure 3. Mature larva of the cypress weevil, Eudociminus mannerheimii (Boheman). Photograph by Jeffrey Lotz, FDACS-DPI. Pupa: creamy white and similar in size to adult. Although there are no published scientific studies on the biology or behavior of the cypress weevil, its life history appears to be similar to that of the closely-related pine regeneration weevils, Hylobius pales (Herbst) and Pachylobius picivorus (Germar). 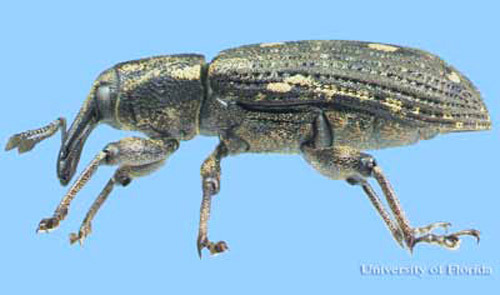 Adult cypress weevils feed on the bark of host twigs or young seedlings, which can result in twig or seedling mortality. Eggs are apparently laid in niches on the roots, root collar, or trunk of weakened, injured or fallen stems and stumps. Larvae tunnel in both the phloem and the xylem of the trunk or roots (Hopkins 1904, Baker and Bambara 1999). During an infestation of small diameter (approx. 2 to 3 cm) bald cypress nursery stock in northern Florida, young larvae tunneled beneath the bark and spirally around the stem, eventually boring straight down the center of the stem and pupating in a chamber within the wood. The number of annual generations and timing/duration of life stages is uncertain, but there are probably two or more generations per year in Florida, with adults present year round. 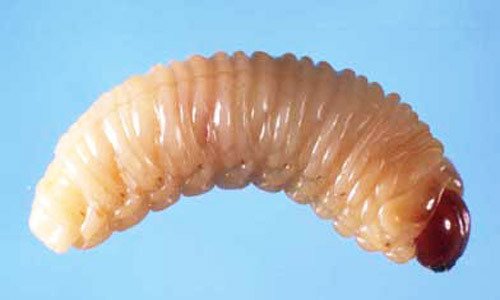 In the southeast, grub activity has been observed in both fall and winter, and adult activity in spring, summer, and fall. Reported hosts of E. mannerheimii include bald cypress, pond cypress, arborvitae (Platycladus orientalis (L.) Franco), Leyland cypress (x Cupressocyparis leylandii (Dallimore & Jackson) Dallimore) and Japanese cedar (Cryptomeria sp.) (Hopkins 1904, Baker and Bambara 1999). Because New York is within the reported distribution of the cypress weevil, yet north of the natural range of our native Taxodium species, Baker and Bambara (1999) suggested that the insect may have an alternative host in that region, perhaps Atlantic white cedar (Chamaecyparis thyoides (L.) BSP). Taxodium mucronatum Ten. 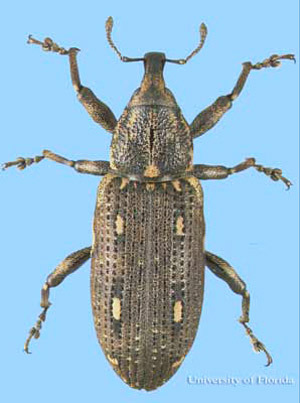 is a confirmed host of the cypress weevil in Mexico (Sánchez-Martínez et al. 2010). 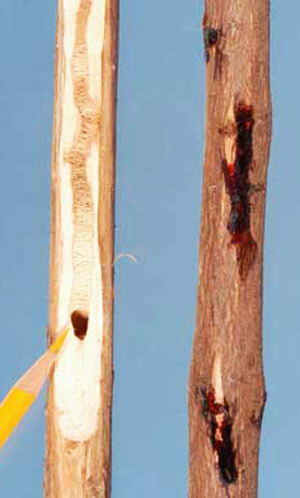 Host saplings infested with larvae may exhibit slight stem swellings from which resin bleeds. Removal of bark reveals galleries (sometimes spiraling around the stem) of increasing width and packed with frass and fine sawdust. 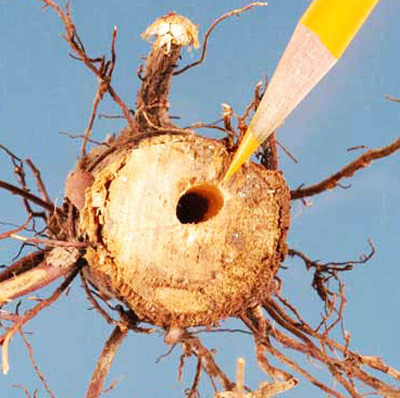 Late-stage larvae can create large tunnels and pupation chambers in the woody stem or root collar. Figure 4. 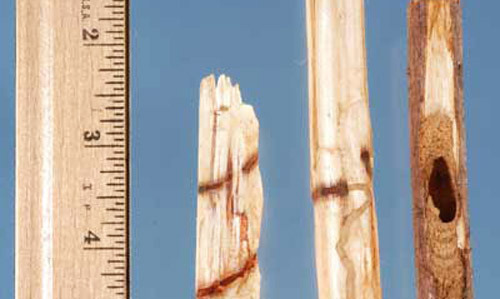 Bald cypress sapling infested by the cypress weevil, Eudociminus mannerheimii (Boheman); showing (a) interior larval tunneling, and (b) exterior resin bleeding. Photograph by Jeffrey Lotz, FDACS-DPI. Figure 5. Young bald cypress saplings, infested by the cypress weevil Eudociminus mannerheimii (Boheman); showing (a) larval galleries, and (b) pupation chamber beneath the bark. Photograph by Jeffrey Lotz, FDACS-DPI. Figure 6. Larval gallery in bald cypress sapling root collar infested by the cypress weevil, Eudociminus mannerheimii (Boheman). Photograph by Jeffrey Lotz, FDACS-DPI. Close inspection of dying host seedlings or young shoots may reveal adult feeding/debarking wounds on stems or seedling roots. Although proven trapping procedures for this weevil are not known, piles of split bolts or disks from host trees covered with host branches might be used to attract adults for detection/monitoring purposes. Because cypress weevils are apparently attracted to weakened or wounded trees for breeding, the health and vigor of nursery stock should be maintained. Avoid planting host seedlings or saplings on or next to sites with recently cut, wounded or dying bald cypress or pond cypress. Infested host material can be pruned and destroyed to help reduce local weevil populations. Spraying the branches and/or trunk with an insecticide may be warranted in some instances to avoid damage to high-value nursery or landscape plants (Baker and Bambara 1999). Consult your local Cooperative Extension Service office for current legal insecticide recommendations. Blatchley WS, Leng CW. 1916. Rhynchophora or Weevils of North Eastern America. The Nature Publishing Company, Indianapolis. 682 p.
Hopkins AD. 1904. Catalogue of exhibits of insect enemies of forests and forest products at the Louisiana Purchase Exposition, St. Louis, MO. USDA Division of Entomology Bulletin No. 48. 56 p.
Jones RW, O'Brien CW, Cozar JL. 2003. Nuevos registros de Curculionidae y Apionidae (Coleoptera: Curculionoidea) para México. Folia Entomológica Mexicana 42: 293–294. O'Brien CW, Wibmer GJ. 1982. Annotated Checklist of the Weevils (Curculionidae sensu lato) of North America, Central America, and the West Indies (Coleoptera: Curculionoidea). Memoirs of the American Entomological Institute, No. 34. 382 p.
Peck SB, Thomas MC. 1998. A Distributional Checklist of the Beetles (Coleoptera) of Florida. Arthropods of Florida and Neighboring Land Areas, Vol. 16. Florida Department of Agriculture and Consumer Services, Division of Plant Industry, Gainesville. 180 p.
Sánchez-Martínez G, Equihua-Martínez A, González-Gaona E, Jones RW. 2010. First record of Eudociminus mannerheimii (Boheman) (Coleoptera: Curculionidae) attacking Taxodium mucronatum Ten. (Cupressaceae) in Jalisco, Mexico. The Coleopterists Bulletin, 64: 96-97. Originally published as DPI Entomology Circular 415. Publication Date: November 2005. Revised: February 2014. Reviewed: December 2017.